I've finally made it to start decorating for Valentine's Day. I limit it to this area and it adds just enough happiness to make me smile! New this year I had to pick up the King of Hearts because he goes with my Queen of Hearts from last year (Pier 1). I love her the most- her details are the cutest! I used her for a tablescape last year that you are welcome to visit "here" She's adorable from top to bottom! When it comes time I will put a small cake or cupcakes on this cake stand. For now the candies in the oversized mug will do! These a strawberry flavored chocolates! XO plates from Sur La Table and the glass heart from Pier 1. Brass hearts from TJ Maxx last year. 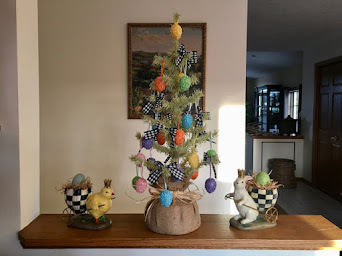 I decided to extend the decorating all the way to the bottom so I changed out the lantern to a white one and added puffed red hearts to the little pine trees. I was hunting through my dishes for something black and white and decided to go on the wild side with these animal print dishes made by Mikasa. The heart stemware was from TJ Maxx several years ago. A little more hearts added to the two candle sconces. A Heart Full Of Love On The Plate Rack! Since I've spent a lot of time at home trying to shake this sinus/ear infection along with hubby we've had our share of soup and sandwiches! Join us for some Salad, Soup and Sandwiches! You might be thinking she forgot the soup bowls! Well not quite but I did incorporate them into the centerpiece! The greens are a faux placemat made to look like cabbage leaves that I pushed down into the salad bowl to add some layering and color! I've been wanting to use these deer tree branch salad plates again. 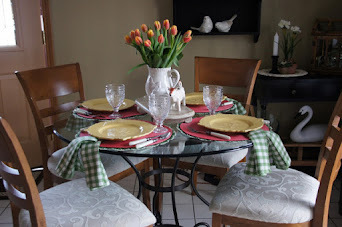 I chose a placemat with pinecones and evergreens to be the backdrop and wicker placemats. The dinner plates were from Cracker Barrel quite a while back. The soup bowls came out of another collection by Home Essentials. Once again the bamboo flatware seemed to be the best choice! I chose a solid blue napkin to draw on the blue coloring from the birds on the salad plates. The plan is to use the wooden bowl for the salad to serve from. Of course the soup bowls and leaf placemat has to be removed first. After salad is served then the soup will follow with simple grilled cheese sandwiches. It started snowing last night and we received more this morning. Weather wise this has been a most unusual January for us. The temps have been mild which makes winter so much more tolerable. Around Christmas time I asked for another pan. I wanted a 2 quart size that didn't come with the initial set that we had. 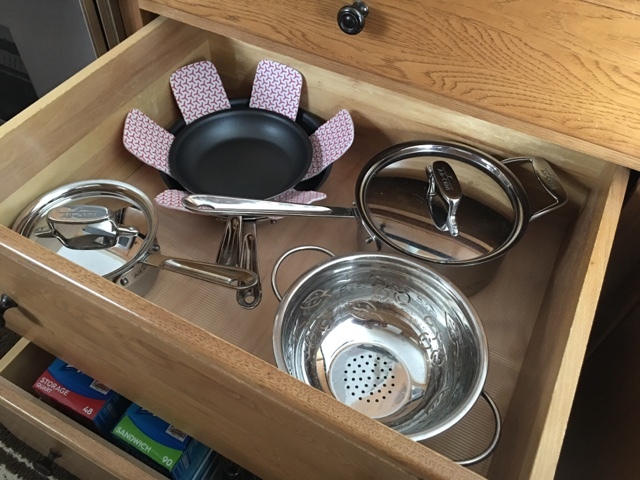 I was really fed up with how difficult it had become to get a pan out of my pots 'n pan drawers so I emptied everything and went at it. This is the 2nd drawer below and as you can see it was a disaster too. I had put my larger less used pots in the bottom and stacked inside of them but it was a chore to get to one of the larger pots out. 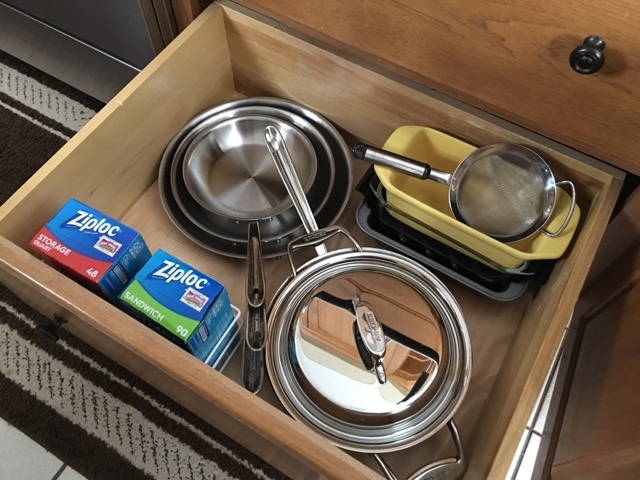 On the right side of the pots 'n pans drawer is a cabinet with two pull out trays. 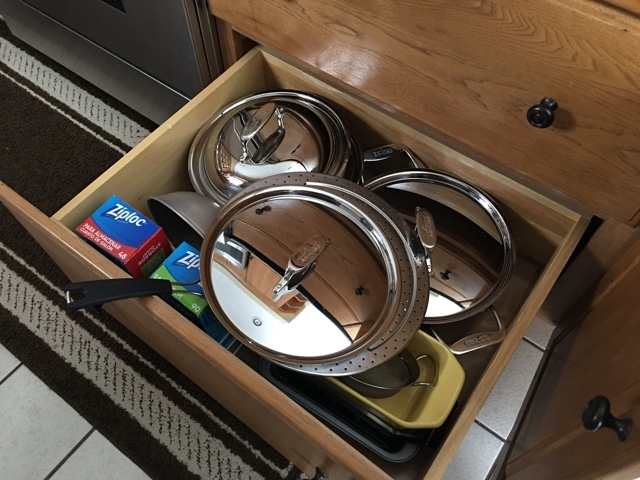 Through the years I've used them for a variety of things including baking pans and casserole dishes. 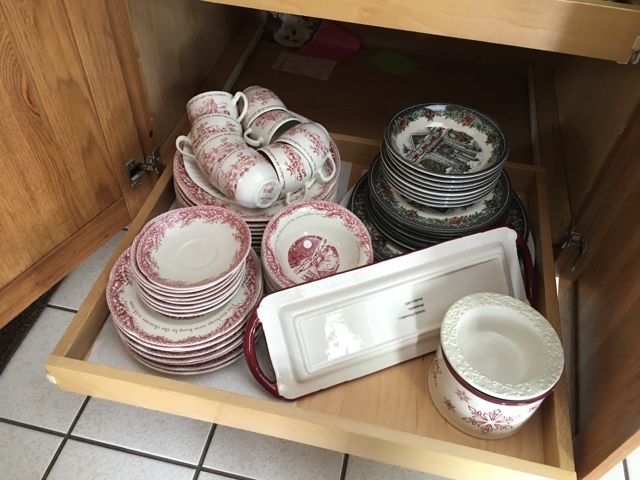 More recently for dishes that I talked about in this post "here". 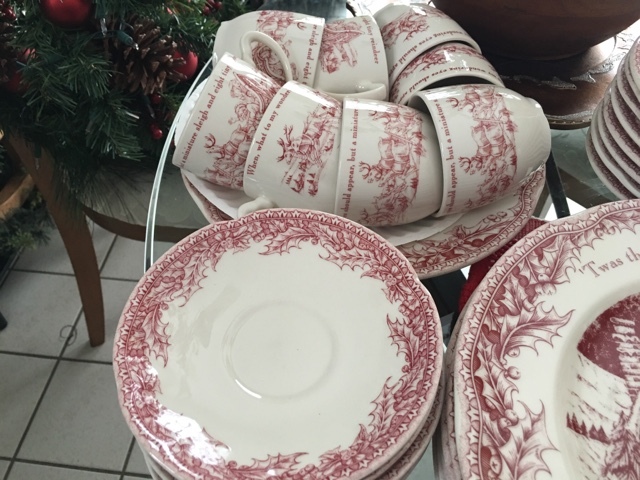 These are Christmas dishes that had been in an upper cupboard and last year I moved them down here. My new ideas was for the big pots to go down here on this pull out shelf and since I rarely use these dishes I packed them in a plastic tub to save. I was going to sell these but when I looked them up at Replacements Ltd., I decided to keep them. They've increased in value a bit so I'm hoping one of the kids will want them someday. This is how the top drawer looks now. I didn't have the new 2 quart pan yet when I took this picture but once it came I just shifted the pots around a bit and they all fit nicely. This is the bottom drawer now and it's sooo much easier to get at things now. One other time when I updated the kitchen I had Dan install the white enamel wire rack to hold the sandwich and quart sized plastic bags. It added a bit more efficiency for that kind of item. I have a small galley kitchen so every inch counts. The bottom pull out tray now houses the larger pots and a couple of odd pieces. Can you believe all of this was in the bottom of the other drawer! This is the upper pull out tray and I keep the small electrics on it and that has been working out great. 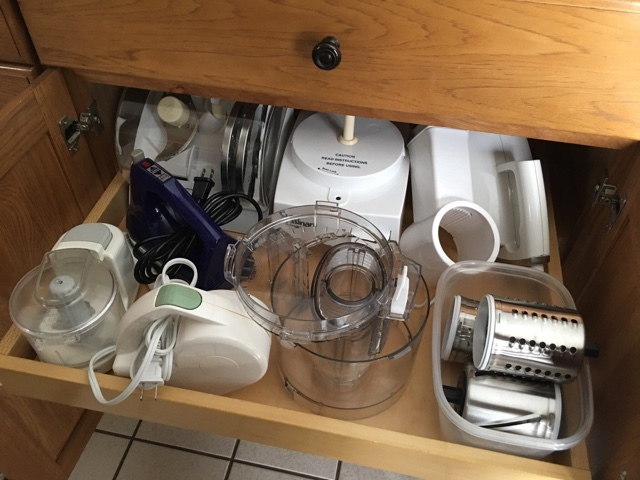 Downstairs in my utility room I have two pantry cabinets that also houses some rarely used things for the kitchen like cake carriers, and large serving trays. This picture shows the cupboards I took a while back. 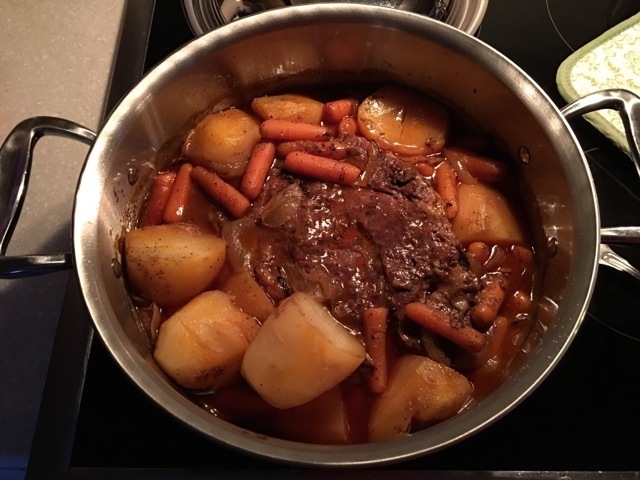 Over the weekend I made a pot roast and I was so thrilled to be able to get at the pot so easily! My cold got much worse that I mentioned last week. 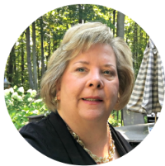 I ended up at the doctor's office and I had developed a sinus and ear infection. Right now my left ear is mostly deaf but at least the pain has gone away. I've been on anti-biotics for almost three days and they are helping me turn the corner. Thanks for visiting and I hope I've inspired someone to do some organizing! 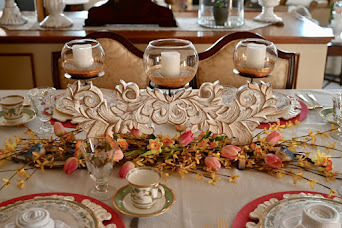 I pulled the dishes from the plate rack and put together a tablescape. I worked to keep some Asian flair going. 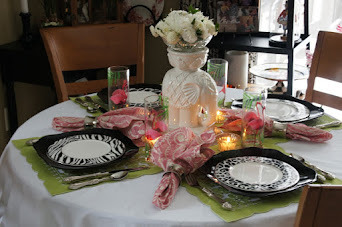 I added the table runner to break up all the white and it added a bit of elegance to the setting. I wanted some fresh flowers but because of icy conditions and schools closed I didn't want to run to the store for another choice. I still had one more Amaryllis stalk in bloom so I decided it would be used. This red and white mix would not have been the first color I would have chosen for this tablescape but it ended up working out nicely. The vase was a find at T.J. Maxx that was meant for a seascape table I never put together. I decided it's texture was a good pickup to everything going on here. I rolled some paper toweling and placed it around the center to support the stalk. The little white teapot holds just enough for two servings. The cobalt blue stemware came from Pier 1 in the clearance section a couple of years ago. The blue bird salt and pepper shakers fit in here nicely too! 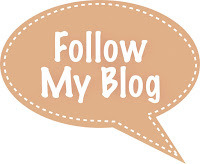 Visit my previous post to see most everything here and details of where I got these. I chose some bamboo flatware to pair up with the dragon salad plates. The green napkin ring holders have been with me a good while. Again I liked the texture for this setting. I've been home a lot over the past week and a half due to a mild cold I came down with after taking care of my hubby who got it much worse. We've drank just about all the tea I had on hand and since neither of us is interested in cooking right now we're going to get soup, sesame chicken, fried rice and egg rolls from the Chinese takeout at the mall. Like a lot of us after the red and green holiday decorating got put away I'm in the mood for blue again. While rummaging through my dish stash I found these dishes I forgot I had. I ordered them from Bombay. They sparked an idea to go for an Asian influence design on the plate rack and etagere. I decided I needed a teapot to complete the look and it took a week to get so I was slowed down on presenting this until now. I decided to elevate the teapot on the little cake pedestal to give it more presence. More on the teapot later. I turned each bowl to show the two main patterns on the bowls. I decided to create a organize repetitive display using the plain white napkins and apples for a pop of color. I had to include this cute pair of birds that Michele from The Nest at Finch Rest sent me last year. She loves tea and also sent me some tea and a hand made card along with the birds. 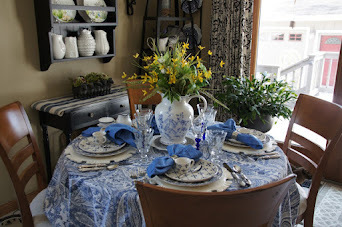 I paired the salad plates with my Ralph Lauren Mandarin blue dinner plates. I love the dragon design in the center of the plate. I found this a couple of years ago at a little boutique shop. It's designed to hold a candle on top but I did't have enough room in this setting. I might add some greenery to it but I have to find the right look. The cups were part of the same set from Bombay and I ordered the white elephant tea pot from World Market. I looked on line at several places and also found it on E-bay and Amazon. I had the red chargers found at Pier 1 a few years back. I thought they'd make a good accent for my asian influenced display. I've had this green lantern for a while and forget to use it. I makes me think of a chinese lantern. I'm considering painting it. Perhaps in red but we'll see. Maybe a sponged on application would be best. I could have added more design elements to this but I was satisfied that I achieved the overall look I was going for. My only new investment was the teapot. I'm enjoying this new look especially since it's quite a departure from my anything I've done before. Reclaiming the living space after the holidays!